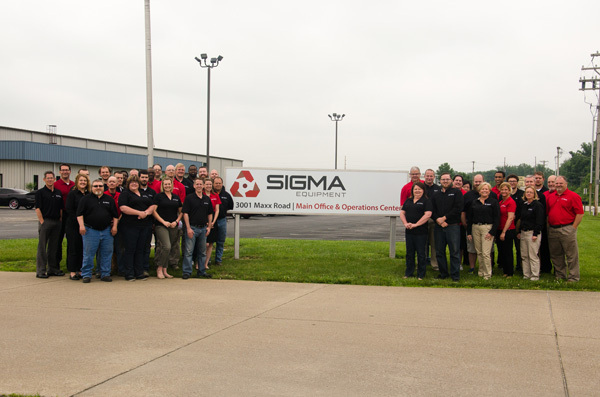 (Evansville, IN) August 12, 2015 -- SIGMA Equipment (formerly Sigma Packaging) announced today its ranking on Inc. Magazine’s 2015 Inc. 5000 list. SIGMA ranks 3800th on the list of the nation’s fastest-growing private companies. Companies are selected for the Inc. 5000 based on company growth over a three-year period. "The story of this year’s Inc. 5000 is the story of great leadership," said Eric Schurenberg, Inc. President and Editor-In-Chief. "In an incredibly competitive business landscape, it takes something extraordinary to take your company to the top." The 5000 selected companies for 2015 are the most competitive group in the list's history. The Inc. 5000 is ranked according to percentage revenue growth when comparing 2011 to 2014. The average company on the list achieved a three-year growth of 490%. "All of us at SIGMA Equipment have put a lot of hard work into growing this company," said Rob Palmer, Founder of SIGMA Equipment. "I think about the growth we’ve experienced over the last twelve years, from a two person operation in a garage to forty-six employees in 450,000 square feet of facilities, and attribute it directly to finding the right people. We’ve built a strong, diverse team at SIGMA focused on moving forward. Our mission is to build real partnerships with our co-workers, customers, community, and industry that empower all to grow." Complete results of the Inc. 5000, including company profiles and an interactive databse, can be found at www.inc.com/inc5000. The Inc. 500|5000 is a list of the fastest-growing private companies in the nation. Started in 1982, this prestigious list of the nation's most successful private companies has become the hallmark of entrepreneurial success. The Inc. 5000 Conference & Awards Ceremony is an annual event that celebrates their remarkable achievements. The event also offers informative workshops, celebrated keynote speakers, and evening functions. For more information on Inc. and the Inc. 5000 Conference, visit www.inc.com/.